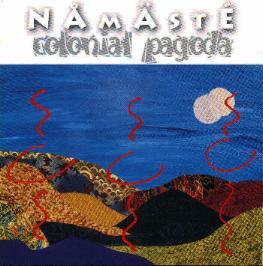 NAMASTE'S first CD is called Colonial Pagoda. The CD contains 11 tracks. Some are original songs influenced by the music of other cultures, and some are our own interpretations of traditional songs. FAINT OF HEART, BE FOREWARNED! These are NOT Smithsonian Folkways recordings of indigenous cultures! We revere the men and women who created the original music. We feel that we honor them more by playing in the spirit of the original than by strict imitation. Colonial Pagoda was recorded and mixed at Right Coast Recording in Lititz, PA. We were fortunate to have the assistance of studio ace Dave Wilkerson as engineer and the notorious Steve Dove as producer. The band stood in a circle in a BIG room and recorded "live" to ADAT (a digital tape format). This was the only way to capture the spontaneity (and danger) of a Namaste performance. The mastering was handled by our good friend Johnne Tuzza at Synergy Studios in Rockville PA. The cover art is entitled "When the Natives Dance" and was comissioned by the band specifically for the CD by Ann lucille. Visit her Web site!